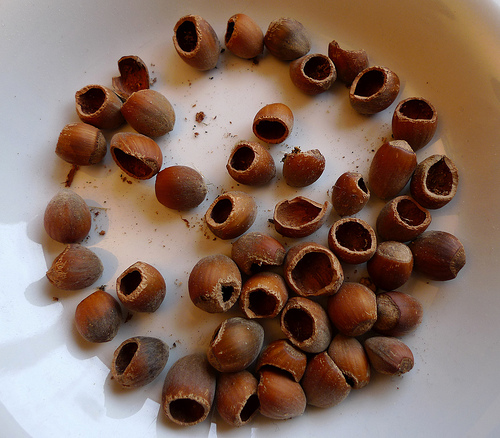 AWT Wild Schools blog: How to become a Nibbled Nut Detective! ﻿﻿﻿﻿﻿﻿ Autumn is the richest time of the year in the plant calendar as many bear their fruits and nuts. Nuts such as acorns, hazelnuts and chestnuts provide a welcome treat to small mammals as they fatten up before hibernating for the winter. Venture out into the woods and try collecting as many nibbled nuts as you can find. Hazelnuts are the best for identifying what's been nibbling them. Use our nibbled hazelnut guide below to find out what's been nibbling yours! You might want to use a magnifying glass to get a better look. Squirrels split the nuts neatly in half. Wood mice leave tooth marks on the nut surface and parallel toothmarks around the edge of the hole. Common Dormice leave a smooth edge to the hole and their toothmarks are at an angle to the hole on the nut surface. Bank voles create a round hole and leave tooth marks around the edge but not on the nut surface. Great spotted woodpeckers break the nut into pieces or leave large irregular pieces. Woodpeckers and nuthatches often wedge hazelnuts into crevices on trees to hammer them more easily. Get involved and let us know what you found!